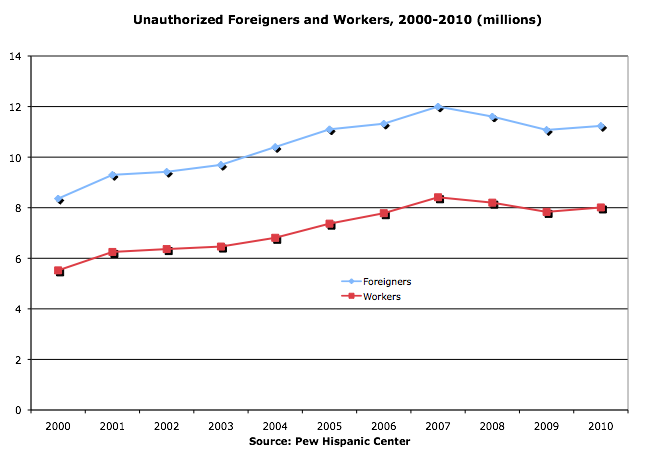 The Pew Hispanic Center estimated there were a peak 12 million unauthorized foreigners in the US in 2007 and 11.2 million in 2010; 58 percent were Mexicans and 23 percent were from other Latin American countries. California (2.6 million) and Texas (1.6 million) included almost 40 percent of the unauthorized. There were eight million unauthorized workers in 2010, down from a peak 8.4 million in 2007; the share of unauthorized foreigners who are in the US labor force rose from 66 percent in 2010 to 71 percent since 2008. States with the highest shares of unauthorized workers included Nevada (10 percent of all workers were unauthorized), California (9.7 percent), Texas (9 percent) and New Jersey (8.6 percent).